The Second World War was a period of continuing racial prejudice. Many officers in the US Army believed that African Americans should be kept out of combat missions and should not congregate in bases located near American towns. This made the option of using African American men for highway construction in a remote area appealing to the military. 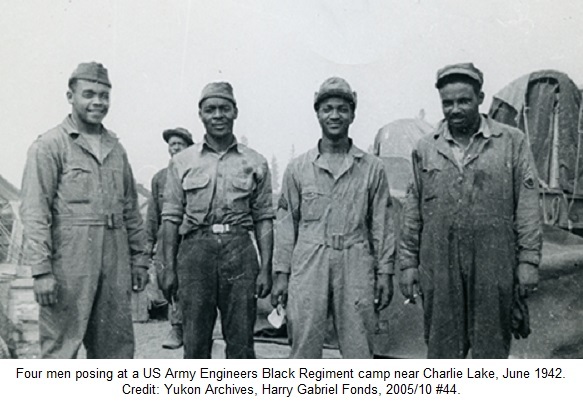 Three out of the seven US Army regiments working on the construction of the Alaska Highway – the 93rd, 95th, and 97th – were composed of enlisted African American men. In pure numbers, of the 10,765 American troops assigned to construct the highway, 3,695 of them were African Americans. Morale in the regiments tended to be low for good reason. They were often provided with insufficient equipment, clothing and accommodation, and their skills were often overlooked by white officers. In one case, the 95th regiment had been given hand tools rather than machinery (which had been saved for the all-white 35th regiment) to work with despite the fact that they had more experience operating the equipment. Despite their hardships and ill treatment, the African American regiments succeeded in constructing a large portion of the Alaska Highway. While stationed at Sikanni Chief River, the men of the 95th regiment bet their pay cheques that they could break all records in bridging it. They won; the Sikanni Chief River Bridge was completed in 84 hours, half the time usually required for bridge construction. For more information on the involvement of African Americans in building the Alaska Highway see: The Alaska Highway, a chapter in the US government’s publication The Road to Civil Rights, and the website Ordinary Men Build a Legendary Road.